I quite enjoyed this issue even though it was nothing like what I’d expcted. The issue ends where I had hoped it would begin, with Elektra showing up at Matt’s side. What we get to see here is not the examination of a relationship between two troubled ex-lovers, but Elektra’s own journey back from Japan in search of Matt. As the first issue of a mini-series, it would have been great. Its biggest problem is that, as a one-shot, it suffers from there simply not being enough of it to tell a full stand-alone story. Zeb Wells made quite an impression on me with his Dark Reign: Elektra mini that came out last year, and he continues his well-balanced take on her here. 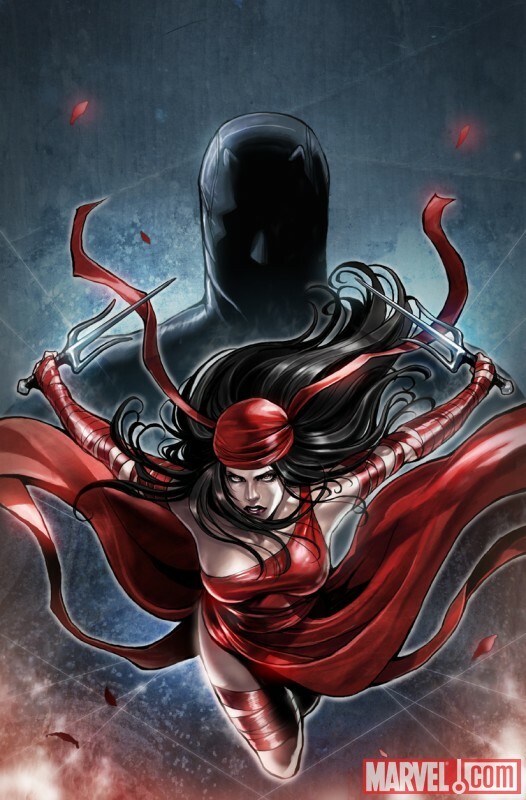 Elektra is usually a rather silent character, and also gives very little away in terms of facial expression, so she presents both writers and artists with quite a challenge. Instead, the team here makes her speak through her actions for the most part and show off how deadly she is by showcasing some of her “work” upon her return to New York. Most of the meat of the story, in terms of character development, comes with Elektra’s interaction with Master Izo. This happens both at the beginning, where they have an encounter in person, and later in story where it’s more of a mind meld, so to speak. As a whole, this is a nice little tale that suffers from feeling like it’s a little on the thin side. Had it been the first issue of a mini, I would have easily given it an 8.0. The way it is, it provides us with as much insight into Elektra’s mind as I think is possible given the number of pages at the writer’s disposal, but I had expected something a little different and something more substantial. Still a good read. Netflix brings us the first half of a Daredevil trailer! This wasn’t bad. The worst thing about this book was it was the only part of Shadowland I enjoyed other than a few fleeting moments in the main Daredevil book. But I was also very disappointed that we didn’t, and aren’t going to, get any real interaction between Matt and Elektra. Shadowland may be a financial success, and thats all Marvel cares about anymore. From every other standpoint Shadowland is a massive failure. character, plot, story, writing, overall art, and certainly respect for the readers have all fallen by the wayside. I wish I’d had just an inkling of this BS before Brubaker left, I could’ve ended my run with the awesome issue 500, and not be stuck with a years worth of garbage ruining my favorite character. I agree with Robert, at least this part had a little heart. I don’t think the art was bad. Can someone make a final decision on how Izo is going to wear his hair; bald or short, I think I even saw a goatee. Doesn’t someone visually edit this stuff. And what ever happened to Stone? Did he retire? I really enjoyed this one but, as you said, it did leave me wanting more. I really wish this was one of the minis! It was still a great experience though. I really enjoyed the art. It was a great contrast to the memories of the Miller/Janson art that was going through my head while reading this. This was especially the case with the last 5 pages. Those pages I felt were especially well done. So far, this one shot and Blood On The Streets are the most satisfying Shadowland titles for me. The regular DD title is good too, but it suffers from being more connected to the Shadowland events if that makes any sense.